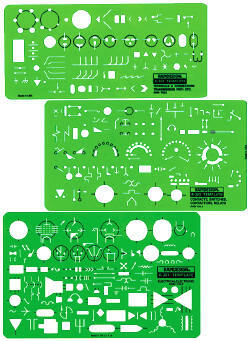 Contains; A comprehensive set of 3 templates conforming to ANSI Y32.2. Templates available in set or individually. Rapidesign R303 Terminals & Connectors, Transmission Path, etc. Graphic symbols for terminals, connectors, transmission path, etc., as shown in ANSI Y32.3 All with allowance for pencil point. Size: 8" x 3-7/8" x .030"